Gates 4pm - 9pm (Gates Open 3.30pm). DJ's/Music/Food Trucks/Licensed Bar Available/No BYO. Electronic, Soul Music, Afro-beat, World, Percussion Collectives & More. 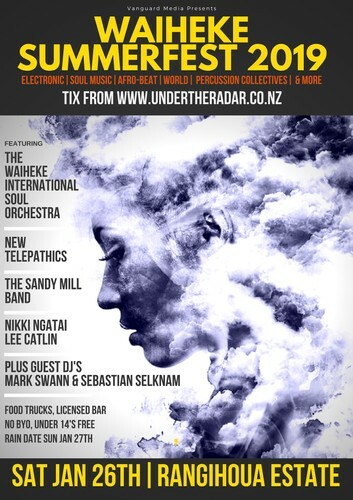 7 piece Electronic, Soul, Percussion Collective The Waiheke International Soul Orchestra (W.I.S.O.) The 7 piece live band have shared the stage with NZ acts such as Yoko Zuna, Sorceress, Latin Aotearoa, P-Diggs and Sunshine Sound System, headlined nights at The Christchurch Jazz & Blues Festival for The Blue Note Series, Okere Falls Strong Bier Fest and Sun Sets Festivals. This is music for an intergalactic future! Respected around the world with an underground cult status, New Telepathics is about communication and pushing the boundaries. Drawing from soul, afrobeat, punk, electronica, jazz, dub and the avant-garde, New Telepathics takes you through a journey to protest the suffering and to celebrate the joy. They were mainstage at SPLORE 2018 this year and are a powerhouse of intense groove. Sandy is well known for her generosity as a musician and her breadth of talent and accomplishments. She is as proficient performing sixties pop melodies and harmonies for New Zealand super-troupe, The Bellbirds (with Victoria Kelly, Don McGlashan, Sean Donnelly) as she is improvising, using her voice as an instrument to recreate gregorian monk chants (with producer Flood reworking of Gary Numan’s Cars album), and across layered irregular time signatures in celebrated 90’s avant-garde, free jazz / dance quartet, Spacesuit. “Basement Jaxx asked me to scream and yell a lot. Not much singing went on in that session, but I learnt another way of approaching the recording process”, she laughs.This multi genre spanning artist has a wealth of New Zealand musician friends and fans that have rallied to shine a light on her incredible talent. Waiheke local Mark has many tracks in his album of life Mark stepped behind the decks in the early 2000's, with a unique mixture of Dub, Kiwiana, house and (many) regular obscurities. With regular airtime on GeorgeFM, Mark went on to co-host the mid-week “Big Big Wednesday” show at the heart of the community, on the well-loved Radio Ponsonby. Mark now being the un-processed organic type, he naturally mixes up a pleasurable blend of Funk, Soul, House, hip-hop and dub, covering everything from the surprise 30th to the art gallery launch, he is an understated favourite. Hailing from Chile, vintage '83, Selknam arrived on New Zealand's shores over a decade ago. Waiheke Island became his home away from home. Playing an eclectic mix of Micro house, Minimal Deep Tech, Techno and Tribal.Selknam enjoys experimenting across electronic musics multiple sub genres, and creating a mystical minimal atmosphere of Minimal and deep tech sounds, influenced by djs and producers from Eastern Europe and South America. Lee Catlin / Nikki Ngatai & more.